Acrok Blu-ray Ripper is able to rip and convert any 2D/3D Blu-ray to 2D/3D videos. Customize and set up your own 3D with Acrok Blu-ray ripper. The best Blu-ray ripper software for Mac users to easily rip and convert Blu-ray/DVD to video/audio on Mac OS computers. Looking for a Blu-ray ripping program and have no idea which one is the best? Here we list top Blu-ray Ripping software according to Google Ranking and user popularity. Acrok Blu-ray ripper is powerful Blu-ray ripping and converting software. It can rip/convert Blu-ray movies to popular audio and video formats. Rip and convert Blu-ray movies to latest smartphones, tablets and Smart TVs best playback format on Windows/Mac. Such as Galaxy S10, iPhone XS Max, etc. Acrok Blu-ray ripper can convert 2D movies to 3D format. It enables you to choose different 3D features and adjust the 3D depth. 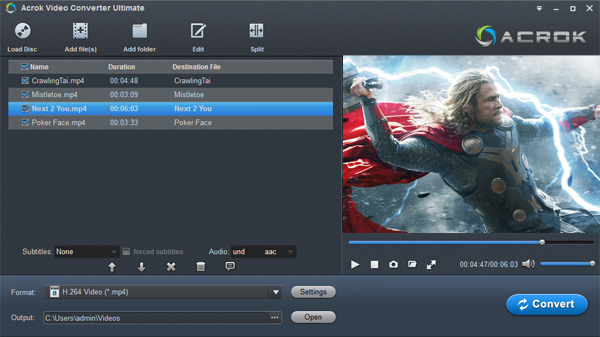 With a built-in video editor function, you are able to customize Blu-ray movies as per your needs. It's equipped with brand-new simple interfaces. If you are a beginner, you can convert Blu-ray movies with only simple clicks. Freely rip Blu-ray movies to various video formats, such as MP4, MXF, AVI, MKV, WMV, MPG, SWF, MOV, TS, RM, ASF, VOB and audio formats, such as MP3, M4A, WAV, AC3, MP2, AMR, FLAC, WMA, OGG, RA, AAC, AU, AIFF, DTS, etc. Want to get this powerful Blu-ray Ripper? Click below button to download, try and purchase this best Windows 10 Blu-ray ripping software. • Free Hard Disk Space: 100 MB or more Supported OS: macOS 10.7, 10.8 (Mountain Lion), 10.9 (Mavericks), 10.10 (Yosemite), 10.11 (El Capitan) and 10.12 (Sierra). Devices: All Canon, Sony, Nikon, Panasonic, RED, Samsung, GoPro, Blackmagic design, Ikegami, JVC, FUJIFILM, Olympus, Leica etc, cameras and comcorders recorded MP4, MOV, MXF, RAW, MTS footage. Android: Google Pixel XL 3/3 XL, Google Pixel Slate, Samsung Galaxy Note 9, Galaxy S10, Galaxy S9, Galaxy S8, Galaxy S8 Plus, Galaxy S7/S7 Edge, Galaxy S6/S6 Edge, Galaxy Note 8, Galaxy TabPRO, Galaxy NotePRO, Galaxy Tab S2/S3/S4, Galaxy Tab A, Kindle Fire, Kindle Fire HDX, Fire Tablet, Nook Tablet, Archos tablets, Asus Transformer tablets, Acer Iconia tablets, MeMo Pad tablets, HTC U11, HTC U12 Plus, HTC Bolt, Xperia XZ3, Xperia XZ2, LG G7 ThinQ, LG V30S ThinQ, LG V35 ThinQ, LG V30, LG X Power, LG V20, OnePlus 6/5/4, LE S3, LE Pro 3, Lenovo smartphones, Moto One， Moto Z3 Play, Moto G6/G5/G5 Plus, Nokia 8, Huawei P20/P10 Pro, Xiaomi 8, Red Hydrogen One, etc. Apple: iPad Pro, iPad Air, iPhone XS Max, iPhone XS, iPhone XR, iPhone X, iPhone 8, iPhone 7, iPhone 7 Plus, iPhone 6, iPhone 6 Plus, iPhone 6S, iPhone 6S Plus, iPad Mini, iPad Mini 4, iPhone SE, Apple TV, iPod Touch, QuickTime, etc. Windows: Microsoft Surface RT, Surface Book, Surface Go, Surface Pro 4, Windows Phone, Nokia Lumia Smartphones, Samsung Windows tablet, Windows 8 tablets, Lenovo ThinkPad tablet, Acer Iconia W tablet, Asus VivoTab tablet, Zune, etc. Others: Editing software including Adobe Premiere Pro, Adobe After Effects, Avid Media Composer, Sony Vegas Pro, Fianl Cut Pro X, iMovie, Windows Movie Maker, , etc. PSP, PS3, PS4, Xbox One, Xbox 360, Wii, PowerPoint, and more. Read our published articles to better understand the functions and features of Blu-ray cracking software. How to play Blu-ray movies on Sony Smart TV with USB? How to watch Blu-ray movies on Google Pixel Slate? How this Blu-ray Ripper (2019) works? Click the "Load Disc" icon on the top left to add the Blu-ray movie to the top Blu-ray Ripper (2019). After the BD files are loaded, you can preview them on the right viewing window and take snapshots of your favorite movie scene. Any 4K/1080P movie, DVD, ISO, IFO files are also supported. Select an friendly format, e.g. H.264 .mp4 for conversion. Basically the "Common Video" > "H.264 Video (*.mp4)" is a universal format for tablets and smartphones. Besides, there are optimized formats for Apple, Samsung, Motorola, Acer, Asus, Sony, Toshiba, HTC, etc branded devices; choose a proper one as you need. Or depends on your device, you can choose a suitable video format from "Common Video" catalogue. When all the settings are OK, click "Convert" button to start converting Blu-ray movies for playback on tablet, smartphone, smart tv or editing in Final Cut Pro X, Premiere Pro CC, Sony Vegas Pro 16, Davinci Resolve 15, iMovie etc. When the conversion is over, click "Open" to locate the ripped video files. After that, you can connect your device to computer via a USB device and transfer the videos to your device for enjoyment on the go. Get the program and start to convert Blu-ray to play on any devices or edit in any program!